Caroline Fye marked her 70th birthday not with her closest friends and family, but in Toms River, New Jersey, assisting victims devastated by Hurricane Sandy. Fye is one of about 46 local individuals who are trained to deploy to disaster areas, and one of about 16 who do so regularly through the Centre Communities Chapter of the American Red Cross. Becoming a septuagenarian while deployed to a disaster area isn’t everyone’s cup of tea, but, like the other dedicated Central Pennsylvania residents who are temporarily willing to put their lives on hold to assist others, Fye finds satisfaction in helping people in their greatest moments of need. The local Red Cross chapter has been working with volunteers such as Fye for almost 100 years. Chapter executive Virginia Brown has been there for nearly 30 years. According to Brown, the Centre Communities Chapter of the American Red Cross, which covers all of Centre County and the eastern third of Clearfield County, began in 1917. Katharine Cotton Sparks, wife of Pennsylvania State College president Dr. Edwin Sparks, was inspired to start the chapter as a way to support American troops serving in Europe during World War I. The organization was originally headquartered in the President’s House, which is now part of the Hintz Family Alumni Center. The Centre Communities Chapter now resides at 205 East Beaver Avenue, Suite 203, in State College, in a building whose past life as a swimming-pool shelter can be seen through the ceramic tiles that still line the walls of the bottom floor. If those walls could talk they’d tell of countless frenzied phone calls, culminating in volunteers snapping into action to help the people of Centre County, or in the case of volunteers such as Fye, people across the country. It’s Romayne Naylor’s job to make sure those calls get made. Naylor, who is the emergency- services manager for the Centre Communities Chapter, has been recruiting, training, and deploying local Red Cross volunteers for almost eight years. She herself has deployed to disaster-struck areas of the country 13 times, to situations as diverse as floods in Pennsylvania, wildfires in Southern California, tropical storms Irene and Lee in New York, and more. In addition to volunteers who deploy nationally, Naylor also oversees five Disaster Action Teams, consisting of four to five volunteers each, that rotate being on-call to respond to local disasters. In 2012, Naylor’s volunteers responded to 37 local incidents that impacted 62 family units made up of 131 individuals. In Central Pennsylvania, disaster is synonymous with fire. The fire that destroyed the Do-De Hotel in Bellefonte was one of the biggest stories of 2012. That fire displaced 27 people, 20 of whom stayed in a Red Cross shelter located at Trinity United Methodist Church in Bellefonte. The community rallied to the victims — so much so that every meal and many other items were donated by other nonprofits and individuals, giving the victims a better chance at a fresh start. Nikki Shariat started volunteering with the Red Cross in December, 2011, about a month after she moved to State College. She was inspired to take part in disaster-relief efforts after firsthand experience with flooding in Nashville, Tennessee, in 2010. She worked five six- or seven-hour shifts at the shelter for those displaced because of the Do-De Hotel fire, and doing so gave her more reasons to have faith in humanity. Naylor has her own “sweetest thing I ever saw” story. It involves volunteer Anita Morris, who has been volunteering with the Centre Communities Chapter for almost a decade. Morris is inspired to volunteer because of her faith and her appreciation for people who aided her in her own times of need. She scours stores for deals on necessities such as coats, toiletries, and blankets that she can donate to local charities, including the Red Cross. She also estimates that she’s made and then donated 300 to 400 blankets. “If I don’t do it, I don’t feel good,” Morris says of volunteering. One night, Naylor put one of Morris’s blankets around a woman who was standing in the cold, watching her apartment go up in flames. The woman looked at it, asked “Is this homemade?” and burst into tears. 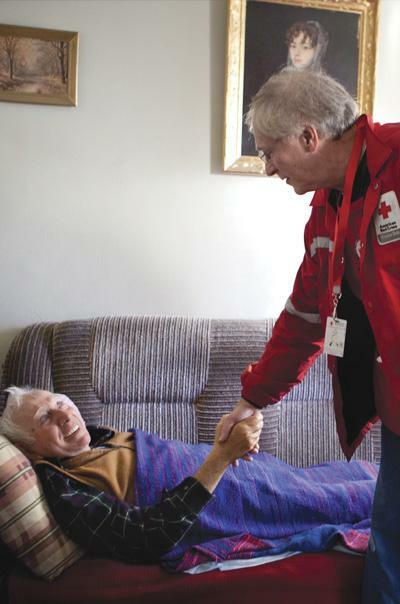 Sometimes a disaster requires that Red Cross volunteers provide support locally and across state lines. Many areas were not so lucky, so 10 local Red Cross volunteers deployed to a “mega-shelter” at East Stroudsburg University, at which many New Jersey residents sought shelter from the storm. Volunteers were given just 12 hours’ notice that they were needed at the shelter. Four volunteers drove down at 3 a.m., with the rest of the volunteers following later that day. These volunteers provide direct client services such as feeding, operating shelters, helping people sign up for Federal Emergency Management Agency (FEMA) assistance and more. As of the end of January, for Hurricane Sandy alone, the local Red Cross had deployed 11 individuals, many of whom took multiple 2-3-week deployments, for a total of more than 180 days of deployment. The Centre Communities Chapter benefits in multiple ways from the tens of thousands of students who attend Penn State at any given time. Students tend to be young and healthy, making them the perfect candidates to donate blood. The organization also benefits from having dedicated student volunteers who take time out from their busy class schedules to help organize blood drives and other Red Cross activities. According to the Penn State Student Red Cross Club’s president, senior Melissa Hubley, the club had 53 active members during the fall 2012 semester, with “active” meaning they dedicated at least 15 hours to the club over the course of the semester. But many of those students dedicate more than the required 15 hours, and with all the activities the club participates in, it’s easy to see why. The club members run programs in local schools that teach children about health and safety. They staff blood drives, sometimes incorporating programs such as Holiday Mail for Heroes, which encourages blood donors to sign cards thanking military service members. They team up with the Delta Sigma Iota fraternity to sponsor two bone-marrow-registry campaigns. They’re also working on getting students trained for deployments, so town and gown can unite when the next disaster hits somewhere across the country. Not being able to deploy didn’t stop the club from assisting victims of Hurricane Sandy. Each year, the club holds two blood-donation challenges against other Big Ten schools, one in April against Ohio State and another in November against Michigan State. The Michigan State drive in 2012 happened to fall right after Hurricane Sandy hit the East Coast. And like most other Penn State student organizations, the Red Cross Club participates in the largest student-run philanthropy in the world — THON. The group has four dancers, and holds special THON blood drives in the winter, at which, for every unit of blood donated, $4 is given to the Four Diamonds Fund, which helps children battling cancer. Blood donation goes hand in hand with THON’s mission, Hubley says, as many THON children receive blood transfusions during the course of their treatment. The hard work these students put in hasn’t gone unnoticed. In the last year, the Penn State chapter was named the hub club for its division, Division 6, which runs from Pennsylvania down through South Carolina. What makes volunteers feel that way? Whether they’re giving blood, manning blood drives, making blankets, rushing to the scene of a local fire, deploying to help people affected by disasters across the country, or lending the organization a pet camel for fundraising events — (you read that right; her name is Kylee and she has her own Red Cross vest) — Red Cross employees and volunteers are united in their desire to help people in need.